Clayton Murphy, a graduate of Tri-Village, finished fourth in the 800 meters at USA Track & Field’s Track and Field Championship. 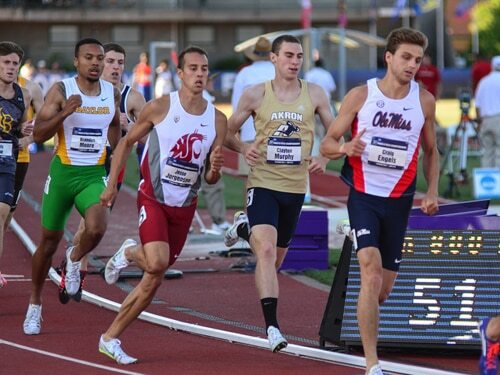 EUGENE, Ore. — Tri-Village graduate Clayton Murphy finished fourth in the nation in the 800 meter run at USA Track & Field’s Track and Field Championship this past weekend at the University of Oregon’s Hayward Field. Murphy, who recently completed his sophomore season at the University of Akron, set a school record of 1:45.59 with his performance in the 800 meter finals Sunday. The Tri-Village alumnus finished less than a quarter of a second behind Casimir Loxsom for third place in the finals. The top three finishers qualified for the International Association of Athletics Federations’ World Championships in Beijing, China. Murphy will serve as an alternate in the event that one of the top three runners — Nicholas Symmonds, Erik Sowinski or Loxsom — is unable to compete. Murphy was just one of two collegiate runners along with Brigham Young University’s Shaquille Walker to compete in the 800 meter finals at the USATF Track and Field Championships. Walker finished sixth in the finals. According to Akron’s official athletics website, Murphy’s performance is expected to be strong enough to earn him an invitation to compete for the United States at the Pan-American Games in July in Toronto. To reach the finals at the USATF Track and Field Championships, Murphy finished second in his heat in the 800 meters on Friday with a then-school record time of 1:45.78. He finished seventh overall in the semifinals to earn one of eight spots in the finals. In the quarterfinals Murphy posted the top time of 1:46.35, which was a then-personal best for him.